If you heard someone talking about “flake,” “boy,” “Lucy,” or “grass,” would you know whether they were referencing legal or illicit substances? To keep tabs on the growing catalog of drug-related jargon, the Drug Enforcement Administration (DEA) released an extensive report in 2017 identifying many of the known words and slang associated with drugs like cocaine, heroin, and marijuana. 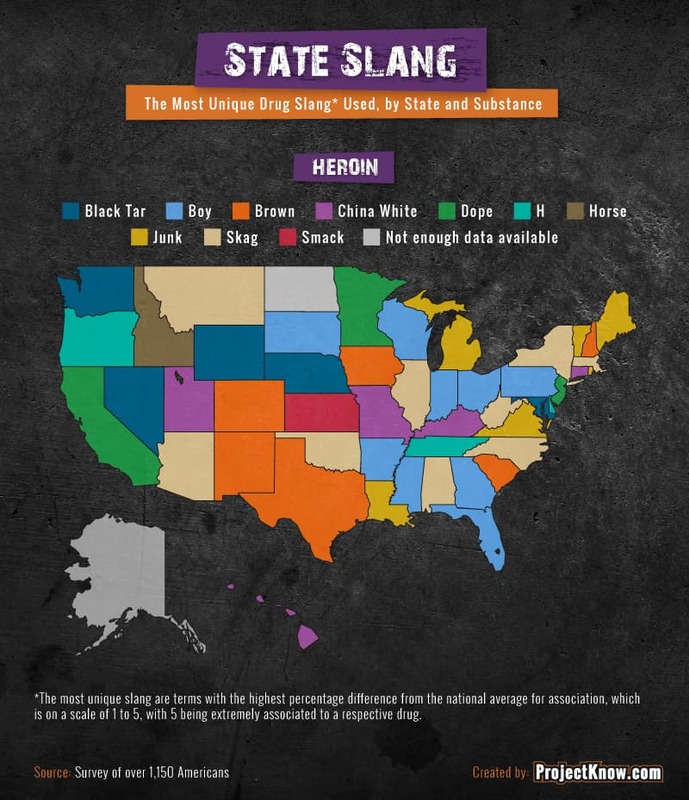 To understand the unique drug slang used in communities across the country, we surveyed over 1,150 American men and women about their evolving vernacular and if they could correctly identify the drugs in question. Want to know which states are referring to ecstasy as “vitamin E” and where people may be picking up this lingo? Read on to see what we uncovered. Depending on where in the U.S. you live, some of the most dangerous substances may be going by some fairly surprising terms. In the same way drug trends change over time, the words used to describe certain substances may too evolve. Today, some of these substances could be going by phrases you’ve never heard before or might not think to identify with drug use. 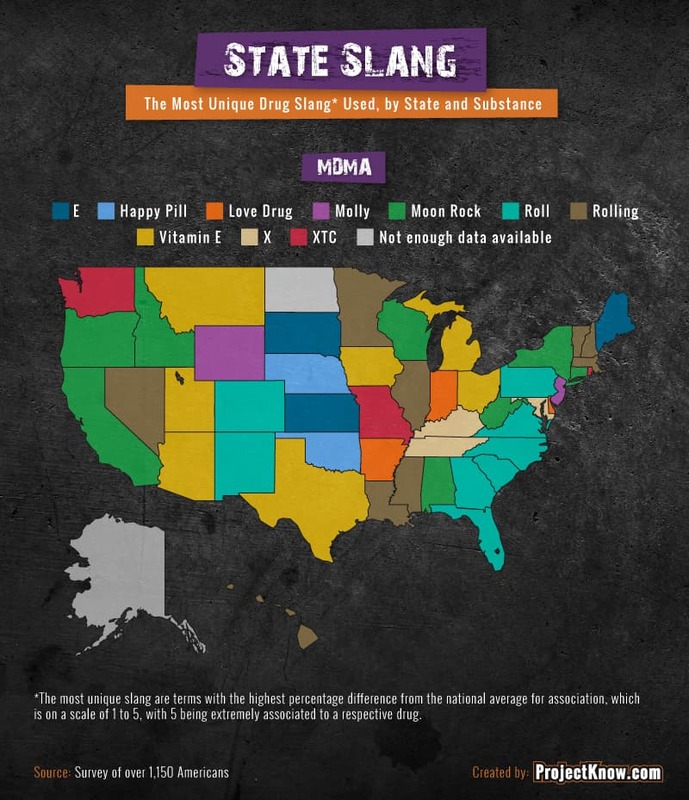 Our maps break down the unique slang terms used by respondents to characterize cocaine, heroin, LSD, marijuana, MDMA, methamphetamine, and Xanax. In 2016, over 10,000 Americans died from cocaine-related overdoses. As an addictive stimulant, “rock,” “snow,” or “crack” may not be the only terms people are using to talk about cocaine. According to our survey, in the West (including states like Hawaii, Colorado, and Utah), the most unique slang term used for cocaine may just be “coca.” In fact, cocaine is produced from the leaves of the coca plant, which grows almost exclusively in parts of South America. 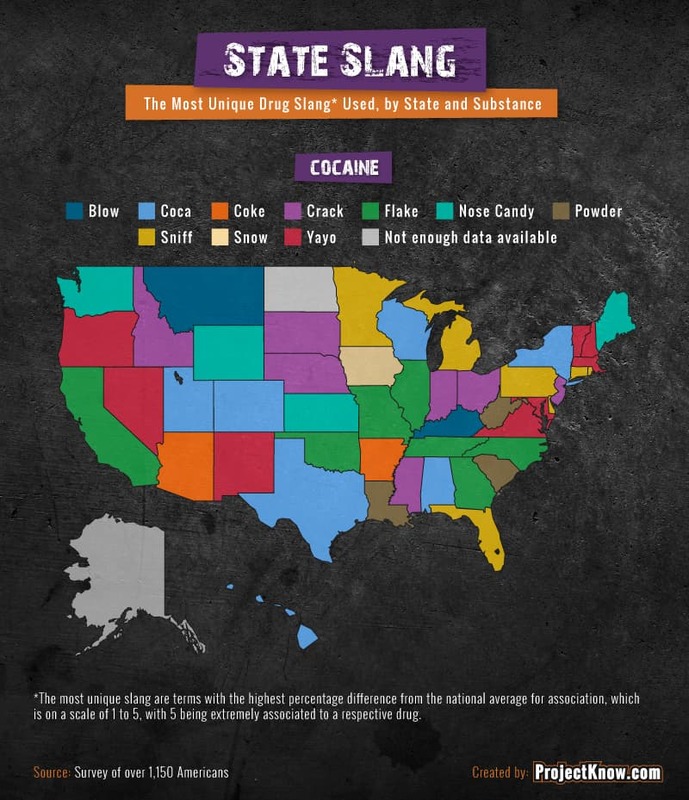 In the Southeast (including Georgia, Tennessee, and North Carolina), the most unique slang for cocaine was “flake,” while terms like “sniff,” “yayo,” and “nose candy” ranked elsewhere across the nation. Unfortunately, heroin use has risen across the country in recent years. Over the last decade, heroin use has more than doubled among young adults between 18 to 25 years old. In 2015, nearly 13,000 people died from heroin-related overdoses. You may be familiar with slang like “dope” or “smack,” but in states like Texas, New Mexico, and Colorado, the most unique way to describe heroin was “brown.” There are many characteristics that can affect the color and physical state of heroin, including turning it black, white, or brown. Brown heroin tends to originate from Southwest Asia. In Mexico, a solid form of heroin produced is commonly known as “black tar,” which was among the most unique names for the substance in Wyoming, Nebraska, and Nevada. LSD, like some other hallucinogens, may have a reputation for being a “party drug” as a result of its low levels of toxicity, but LSD can come with long-term health risks in rare cases. Risks are more likely to be psychological than physical; however, effects including anxiety, panic attacks, and paranoia can often be worsened by the physical effects of LSD. We found slang for LSD ranged from terms like “cid” and “tabs” to “Lucy in the Sky With Diamonds.” In Midwestern states including Michigan, Ohio, and Indiana, the most unique term for LSD was “blotter acid.” Blotters are the name typically given to the paper that users ingest when consuming the drug. As of 2017, 29 states including Washington, D.C., passed laws legalizing marijuana in various capacities. In seven of those states (in addition to D.C.), those laws included recreational use. Despite health consequences of marijuana use, including declined cognitive function and memory lapses, support for legalized marijuana use in the U.S. is on the rise. In 14 states including California, Texas, and Florida, the most unique term used to describe marijuana wasn’t really that uncommon: “dope.” Also referred to as “grass,” “Mary Jane,” and “ganja” in various parts of the country, the legalization and popularity of marijuana may have reduced the need for such abstract terminology. MDMA (sometimes referred to as “ecstasy”) isn’t always the only substance you might find being marketed and sold under this name. While the substance is stronger today than in years past, it’s been known to include fairly toxic additives. The immediate effects of MDMA may include increased feelings of warmth, empathy, and general well-being, but even just two years of heavy use has been linked to decreased cognitive function in addition to sleep disturbance, lack of appetite, and depression. Not to be confused with the natural supplement, the most unique slang term used for MDMA was “vitamin E” in seven states including Arizona, Utah, and Michigan. It was also referred to as the “happy pill,” “love drug,” and “Molly” in other states. Between 2010 and 2014, the number of fatal overdoses from methamphetamine more than doubled. Identified as one of the most lethal substances in this five-year span, the majority of drug overdoses involving methamphetamines did not include any other drugs. Today, Xanax is the ninth best-selling drug in the U.S. and the fifth most prescribed drug in the country. Despite its regular use and recommendation from trained medical professionals, 125,000 people end up in the emergency room every year as a result of complications with Xanax use. Research has shown 7 in 10 teens who become addicted to Xanax take the substance from a medicine cabinet at home. In Northern states across America, “hulk” was the most unique term used to describe Xanax. While there are different variations of Xanax, some forms of the pill are colored green, giving them their comic-themed moniker. 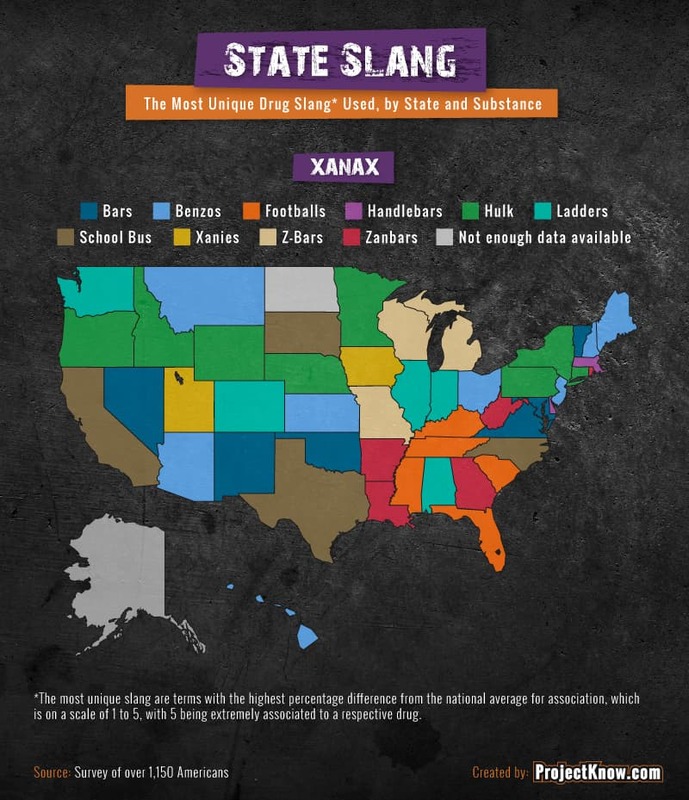 Across parts of the South (including Florida, South Carolina, and Tennessee), “footballs” was a more common code name for Xanax, followed by “zanbars,” “school bus,” and “ladders” in other regions. According to our research, the slang terms used to describe drugs can vary wildly across generations, genders, and even educational status. 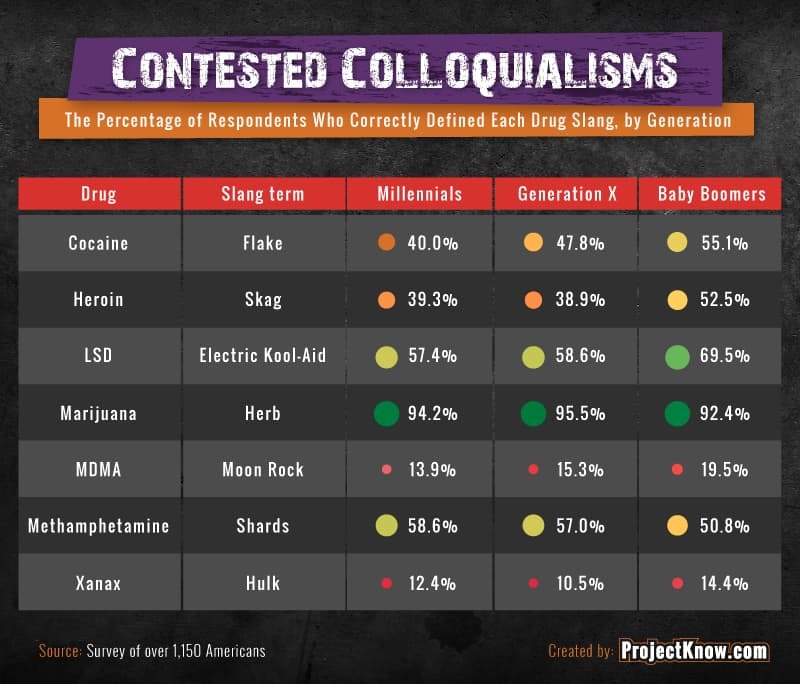 Except for Xanax (referred to as “Hulk”), we found no generations used the same unique terms for the drugs surveyed. Research has shown millennials are less likely to use illicit drugs than previous generations, including more dangerous substances like cocaine. Instead, America’s youngest generations have moved on to prescription painkillers, using more of these drugs in their teens, 20s, and 30s than either baby boomers or Gen Xers at any point in their lives. Men and women also had different perspectives on how to talk about drugs. For men, “ganja” was the most unique way to refer to marijuana, while women used the word “pot.” In general, men had more obscure terminology, while women used more common epithets. The slang identified by the DEA might seem silly to some, but the DEA acknowledges being as thorough as possible in defining the words used to describe these drugs. Given the seemingly nonsensical relation of words like “skag” and “flake” to illicit substances such as heroin and cocaine, we quizzed our more than 1,150 participants to see how many could correctly identify these drug-related phrases. Except for methamphetamine and marijuana, baby boomers more correctly identified the surveyed terms than any other generation. Nearly 70 percent of baby boomers recognized “electric Kool-Aid” as LSD, and almost 1 in 5 correctly identified “moon rock” as slang for MDMA. While Gen Xers were the most familiar with “herb” as slang for marijuana, millennials were more likely to recognize “shards” as jargon for methamphetamine. So where are most Americans picking up their obscure drug terminology? Nearly 81 percent of Americans admitted what they knew came from their friends. Given the rising trend of “digital peer pressure,” it’s no surprise that more than 70 percent of people polled also said they learned drug slang from the internet. In addition to people they may know in real life, the images and information teens and young adults pick up from celebrities and other high-profile figures could have a tremendous impact on what they know and how they feel about drug and alcohol use. 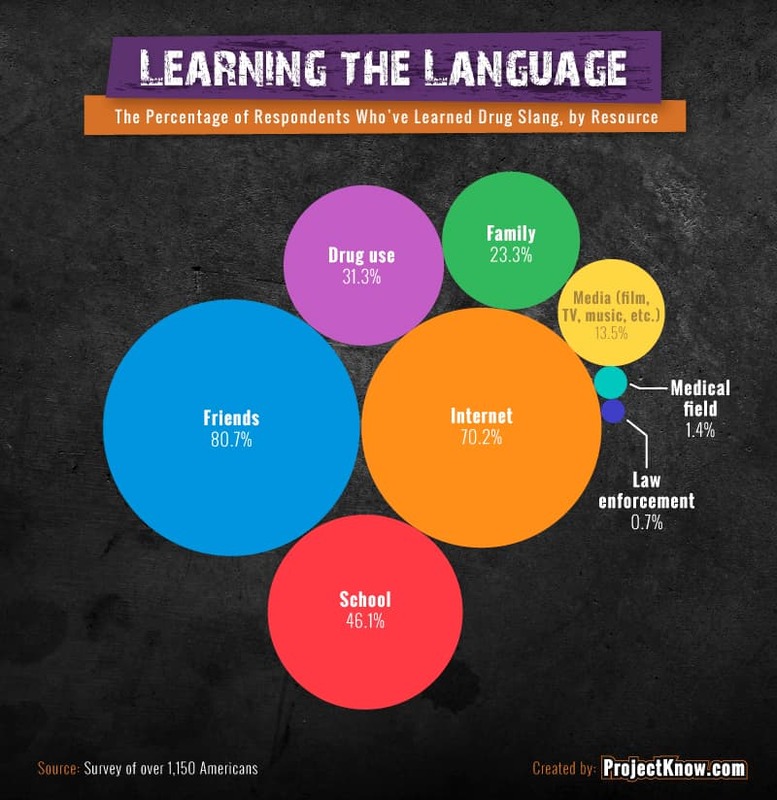 For more than 46 percent of Americans, their understanding of lesser-known drug terminology came from school. Perhaps not an item on any official lesson plan, research conducted by the National Institute on Drug Abuse revealed almost 1 in 10 high school sophomores reported using an illicit drug other than marijuana at least once in the year prior to the survey. Though less common, drug use, family, and media outlets including TV, movies, and music were other ways people learned ways to talk about drugs. Regardless of how you say it or what you think the words mean, drug use is having a huge impact on the lives of Americans across the country. In 2015, the number of total drug-related overdoses rose to over 50,000, the highest rate ever. The number of people losing their lives to drug misuse isn’t just on the rise – it’s estimated to be rising faster than at any other point in history. If you or someone you love has an addiction, you are not alone. At ProjectKnow.com, we believe that understanding addiction is the first step to finding help on the journey to sobriety. From intervention and detox to rehabilitation and aftercare, ProjectKnow can guide you every step of the way on your treatment journey. To learn more, visit us at ProjectKnow.com. We surveyed over 1,150 Americans from Amazon’s Mechanical Turk and Reddit about the slang terms they associated with various drugs to see how slang changed by geography and demographic. Thirty-six states had 20 or more respondents, 12 states had 11 to 19 respondents (Arkansas, Delaware, Hawaii, Iowa, Mississippi, Montana, New Hampshire, New Mexico, Rhode Island, South Dakota, Utah, and Vermont), and two states did not have enough respondents to be included (Alaska and North Dakota). 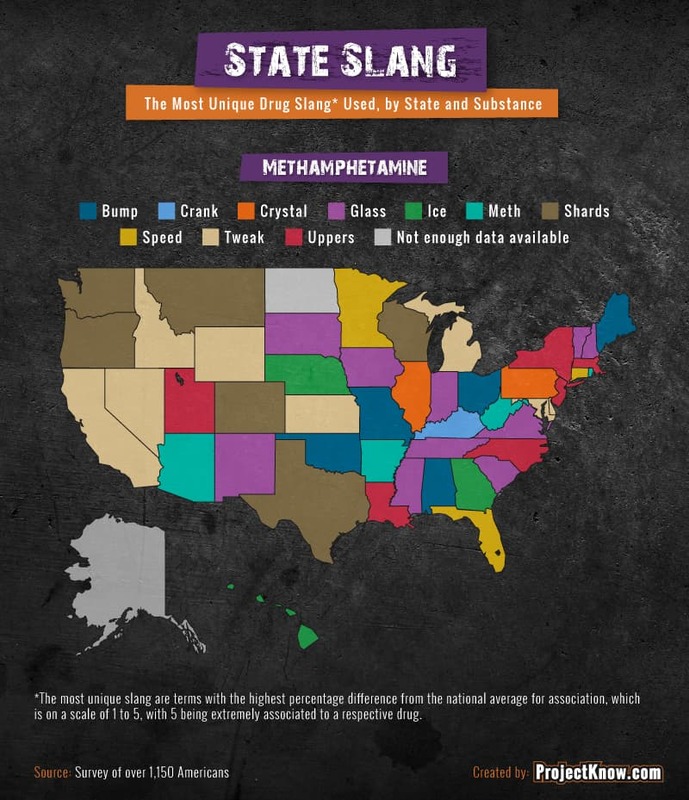 To determine the slang used in this project, we surveyed 50 Americans from Amazon’s Mechanical Turk and Reddit about the slang terms they had heard from the DEA Intelligence Report on drug slang code words from May 2017. 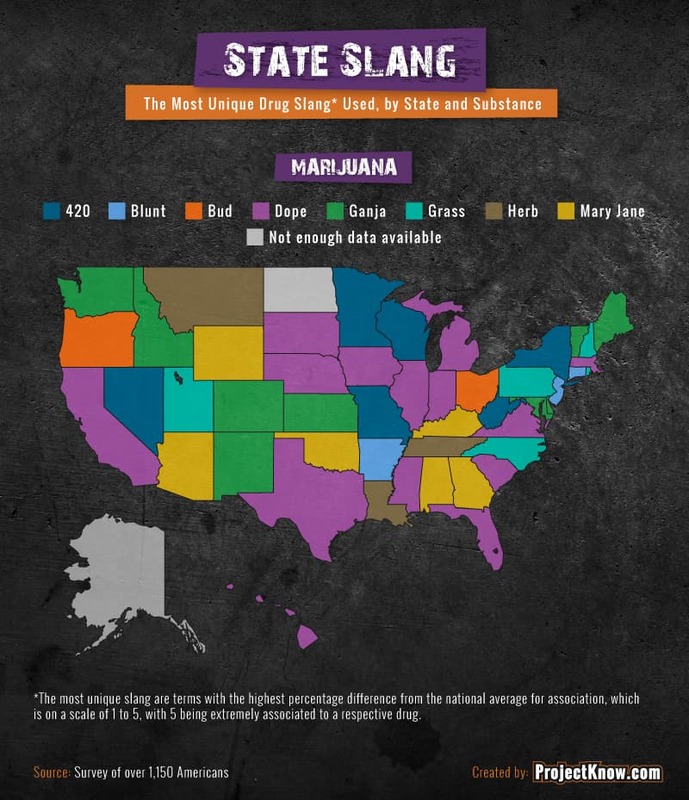 The top 10 most recognized slang terms per drug were chosen for use in the full survey. Since the top one or two associated slang words remained consistent across all demographics and states, we looked at how state association rating averages differed from national association rating averages. 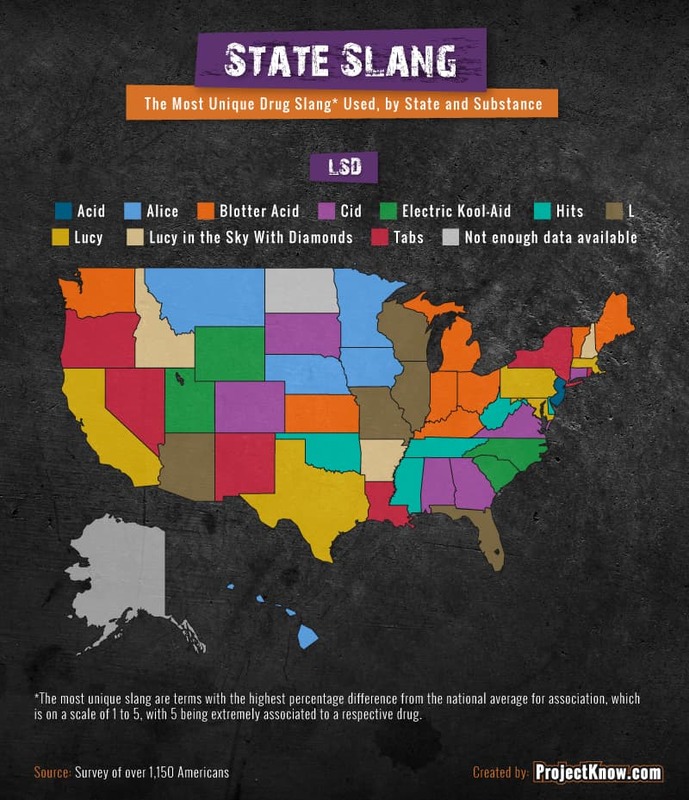 The slang word that each state or demographic rated highest compared to the national average was the term assigned as that state’s or demographic’s most unique slang word by drug. No statistical testing was performed, so the claims listed above are based on means alone. Want to help us spread the word on these unique drug codenames? Feel free to share the data from our study with your readers for any noncommercial use. Just make sure to include a link back to this page, so they see our research in its entirety. You are not alone. Call today and get help now!